Eleanor May Tomiczek, 85, of 19675 Collier Drive, Meadville, passed away Wednesday, January 23, 2019, at home, surrounded by her family. Eleanor was born in Harwick, on May 14, 1933, a daughter of the late Paul and Vera (Bell) Thompson. On June 18, 1951 Eleanor married Karal Tomiczek; he preceded her in death on February 18, 2012. 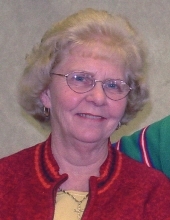 Eleanor was employed by Crawford Central School District as a cafeteria worker at various schools including the former Kerrtown Elementary School. She was a 1950 graduate of Harwick High School. Eleanor took pride in being a homemaker, raising her family, looking after her grandchildren and most importantly caring for her husband Karal as his health declined. A talented baker, making wedding and birthday cakes were her specialty. She also enjoyed gardening and following the Pittsburgh Steelers. She will be missed. Eleanor is survived by three sons Mark (Julie) Tomiczek of Ford City, Lance (Judy) Tomiczek of San Antonio, TX, Steve (Christine) of Cambridge Springs, seven grandchildren Lance Jr., Andrew, Katie, Anna, Ashley, Jessica and her spouse Amanda who provided loving care to Eleanor, Joshua, three great grandchildren Luke, Kaden, Benjamin, a sister Audrey McCall of Freeport, many nieces and nephews. In addition to her parents and husband Karal of 61 years, Eleanor was preceded in death by four brothers. Family and friends are invited to call on Friday, from 2-4 PM and 6-8 PM at STEPHEN P. MIZNER FUNERAL HOME & CREMATION SERVICES, INC. 404 CHESTNUT STREET, MEADVILLE. Funeral Services will be held Saturday, January 26, 2019 at 2 PM at Twelve Apostles Lutheran Church, 358 Euclid Ave., Saegertown, with Rev. Mark Fischer, Pastor, officiating. Eleanor will be laid to rest in Deer Creek Cemetery, Cheswick, PA. In lieu of flowers, memorial contributions may be made to Twelve Apostles Lutheran Church, PO Box 640, Saegertown, PA 16433. To send flowers or a remembrance gift to the family of Eleanor May Tomiczek, please visit our Tribute Store. "Email Address" would like to share the life celebration of Eleanor May Tomiczek. Click on the "link" to go to share a favorite memory or leave a condolence message for the family.